Fast shipping of precast concrete Window Sills to any UK Postcode! KPC has been manufacturing precast concrete window sills almost since its humble beginnings the late 1960’s. 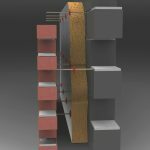 Whether you require bay sills, corner sills or wide face sills, we can offer you a solution that will suit your needs. In fact, we think you’ll agree that we have one of the largest ranges of precast concrete window sills in the whole of Europe. Manufactured in accordance with BS 5642-1:1978+A1:2014. KPC recommend you refer to Eurocode 6 for masonry structure design guidance. Architectural precast concrete window sills (or by the alternative spelling, “cills”) and reconstituted cast stone sills form the lowest horizontal part of window openings and perform both structural and aesthetic functions. Window sills provide the structural seating for window frames which prevents water ingress, and they are sloped outward to direct rainwater water away from the window frame. Window sills come complete with water drip channels on their undersides, to prevent mortar erosion and staining of the outer leaf material. 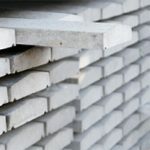 KPC offers one of the widest ranges of window sills in Europe, and are best placed on the UK market to offer suitable profiles for a range of outer leaf materials such as exposed brickwork, rendered block work, natural stone and stone cladding, as well as for both timber frame structural frames and traditional masonry construction. with fast shipping on standard units. We have built up a product range that cannot be matched by any of our competitors. We offer bespoke designs for one-off prestige projects or for any other reason that may arise. We are one of the first precast concrete manufacturers in the the UK and Ireland to design a non-stooled window sill specifically for timber frame construction. Click the image on the left to see a small sample indicative of our large range of profiles. The most important piece of information to know when specifying window sills is the placement of the window frame relative to the outer leaf material. This, together with the desired overhang relative to the outer face, determines the width of the sill you require. The other critical dimension is the face depth of the sill required to achieve your desired aesthetic. Stooled window sills are normally used to complement exposed brickwork on the outer leaf, whereas non-stooled sills are usually the preferred choice for every other outer leaf material. When specifying the length of the window sill, we normally allow for at least 75mm seating on each side of the opening, so use (Opening Width + 150mm) as a rule of thumb. Many of our window sill profiles are compatible with our precast concrete and cast stone string course profiles. Please ask our experienced and helpful technical professionals for specification guidance. Please note- Sills up to 1200mm in length will carry a reduced transport cost relative to those longer than1200mm. For those sills above this length we recommend reducing transport costs by ordering the equivalent required length in shorter sills and using a product such as MatchCrete (click here for information) to joint the sill lengths. MatchCrete is our recommended product for this purpose and will give a non-shrink, waterproof and colour-matched joint. For a quick quote or for design advice call our experienced engineers on 0800 0393367 or email info@killeshalprecast.co.uk, we’d be happy to help. KPC offer Tactile Studs and Strips for use as anti-slip aids and particularly as aids for the visually impaired. 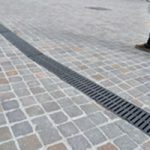 Manufactured from high grade stainless steel and available in a variety of finishes, these tactile studs and strips allow quick and easy conversion of existing standard paving to Tactile Paving. KPC have a fantastic range of precast concrete bollards, in both plain and exposed aggregate finish. To compliment our standard concrete bollard range we also offer contemporary stainless steel (lockable) bollards. All our bollards come in many finishes and custom designs are no problem. KPC manufacture a very wide range of wall caps, also known as wall coping. Our range includes a variety of off-the-shelf styles and sizes at a very cost effective price. Our designs can be modified to suit specific requirements and applications. KPC’s Bus Stop Kerb is intelligently designed to provide safer and easier passenger transition on and off buses. We're confident that you'll not find a better value Bus Stop Kerb on the market. Put us to the test and find out! © 2013-2019 Killeshal Precast Concrete Ltd.